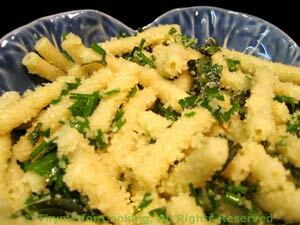 Pasta with Olive Oil, Garlic, Herbs and Parmesan, Thyme for Cooking sides. Simple pasta, tossed with a fruity olive oil, some herbs and an optional bit of garlic. Finish it with some freshly grated Parmesan and you have a side dish worthy of the most discriminating palate. In summer I use lots of fresh herbs; in winter I use dried and add the garlic. Put pasta in a bowl, add olive oil, herbs and cheese. Stir to combine and serve. In same pan over medium low heat olive oil. Add dried herbs and minced garlic, and sauté for a few minutes. Add drained pasta, toss quickly, remove from heat and add Parmesan and serve.